The first step to installing the IPD mesh grille is to remove the stock grille from the car. 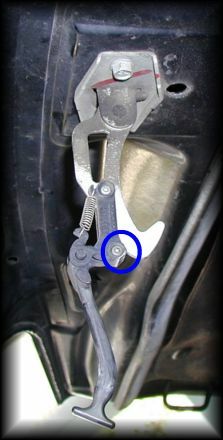 Shown below is one of the six clips that hold the grille in place. To remove the clips, slide them until they can be lifted off their retaining posts. With the six clips out of the way, the old grill is lifted out and set aside. Now, insert the new grille in place and align the mounting holes. Next, place a washer onto the retaining screw and thread the screw onto the grill. 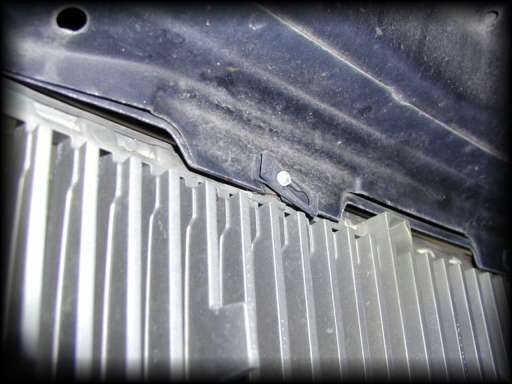 Make sure the mounting tabs are sandwiched between the washer and the grill. Do the same for all 4 corner. For additional security, place a small dab of low strength Threadlocker on the bolts and tighten them until they are secure. There are no torque specs, so you have to go by feel. Circled below in blue is one of the mounting points. 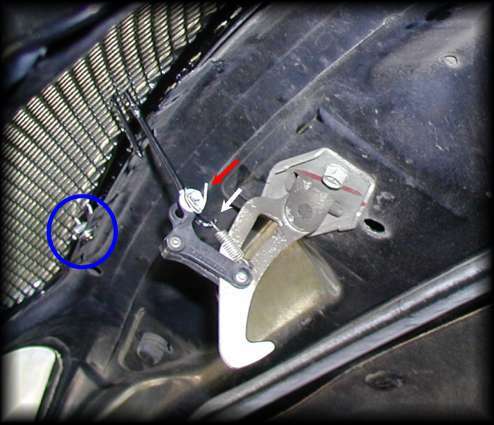 If your car is an 850, then you will also need to modify your original hood latch. Using a T10 torx bit remove the torx circled below. 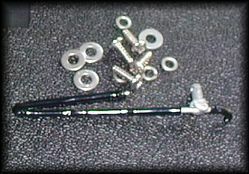 Remove the end of the spring that is closest to the torx which was just removed. You can now remove the stock latch. Next locate the center of the mesh grille, and count 2 holes down. Thread the new latch through that hole as shown above. With the latch in place, mount the end of the latch to the original receiving hole that the stock latch came out of. I do not know why, but the new latch is only secured on one side. With everything now in place, slide the provided retaining washer onto the latch post as shown above. Now replace the torx and re-attach the end of the spring to the new latch (white arrow). IPD does not mention this, but there is a small hole in the end of the post that is on the latch. For additional security, I used a cotter pin to hold the latch in place (red arrow). Before closing the hood, make sure everything works correctly. Once that is done, check it again. If you close the hood and the latch does not work properly you do not have many options. Shown below is the IPD latch with shrink wrap on it for oxidation protection. The latch is prone to oxidation, and for this reason I strongly recommend some additional form of protection. The washers below are not the IPD provided ones. They are stainless steel washers that were purchased at a local hardware store for under a dollar. The IPD bolts are stainless steel, but the washers are not. I strongly recommend upgrading to all stainless steel hardware.